The question is, what took them so long? 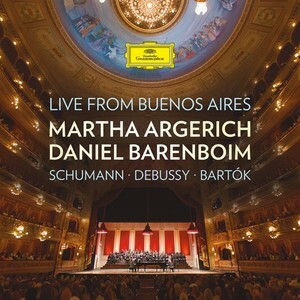 Martha Argerich and Daniel Barenboim, born a year apart in Buenos Aires to Jewish mothers of Russian extraction, have left it until their mid-seventies to discover common ground. Both prodigious pianists, they sailed for Europe where their paths diverged. Argerich won the Busoni and Chopin competitions and worked intensively with Italian conductors, notably Abbado, Muti, Sinopoli and Chailly. Barenboim determined from an early age to be an orchestral conductor. He had no need for other pianists. When he put on a concerto he could play it himself (or call in his mentor, Arthur Rubinstein). Argerich was renowned for her terrifying speeds and unflinching accuracy. Barenboim, as a pianist, was prone to human error while pursuing the bigger picture. They might have inhabited separate planets. Until last summer, when they returned to Buenos Aires to play four-hand piano, playing as if they had played together all their lives. The intuition on this recording defies belief. The pair start out with six little-known Schumann canons, designed for middle-class drawing rooms. All very after-you, but that’s just the warm-up. Debussy’s En blanc et noir is no piece for amateurs or chicken-livers. A tempo risk taken or declined can run the work totally out of sync. These two pianists achieve total trust from the opening note and take more risks than you’d think possible. The climax is an account of Bartok’s Sonata for Two Pianos and percussion that, from a deceptively sedate starting point runs positively riot into all manner of cross-rhythms, atonalities, jazz, jumping beans and – did I hear that right? – tango. This is two-piano playing taken to altogether another level. You’re unlikely to hear better four-hand as long as you live.